our house is in a quiet area with lots of free space with a green garden and park where children can play. The apartment is large (72m2) for 4 people, (but it can still sleep one person in living room with additional payment 15. 00 Euro). There are two limp rooms, dining room, living room with satellite TV and air conditioning, kitchen, bathroom, terrace and balcony. In the garden is a large open terrace with barbecue. We, owners, deal with art especially music. During the months of March, April there is additional charge for heating 5.00 euros a day. With pleasure I give the information that we have finished with great renaissance of our house and also our apartments. We hope that our guests will be even more satisfied with the accommodation in the cottage "JENNY" Porec. TV-Satelit, WI-FI is free! WE ACCEPT THE RESERVATIONS FROM SATURDAY TO SATURDAY !!! Welcome to beautiful house 'Jenny' in Porec, Croatia. Near our house are good restaurants and konobas with good istrianisces Schincken (PRŠUT), good wine and brandy (rakija) and other Istrian delicacies. At the distance of 4 km there is a cave ie. Grotto (deep 170m). When visiting Grotte you can eat well at the entrance to the earth in the restaurant and konoba in the fresh air with the accompaniment of well-known band name DINOSAURI. They play fun music for entertainment. danke, fur Ihre gute Bewertung. Ich frage mich ob ein Liegestuhl wirklich im gesamt Wert ist von eine Sterne, die ich nicht bekommen habe (nur 4 Sterne), obwohl Sie alles in unsere Ferienwohnung sehr gelobt habt?? Es tut mir Leid, dass Peter nicht die Liegestuhl gefragt hat,weil naturlich, sehr gerne hatten wir ihm gegeben und gerne diesen Wunsch ihm erfullt. Wir,als Gastgeber sagen immer zu allen Gaste: Wenn man etwas in der Wohnung vermisst oder wunscht, bitte zu uns (Gastgeber) kommen und fragen,wir werde gerne alles tun wenn in unsere Macht ist. Peter und Conny sind sehr sympatisch und angenehme Gaste und gerne werden wir sie und andere solche Gaste emphangen. "Appartement situé dans une villa à 2 km du centre de Porec. Nous avons été très bien accueilli par la maitresse de maison qui s''est déplacée pour nous guider jusqu''à la villa. L''appartement est spacieux, très propre et conforme à l''équipement annoncé. Cependant, il n''y a pas de freezer ou de congélateur dans l''appartement ce qui peut être génant pour un couple avec enfants (glaces) ou simplement glaçons pour l''apéro. Ce problème devrait être résolu pour 2011. Assez facile d''accès, la voiture peut rester stationnée devant la villa sans crainte. Je tiens à souligner encore une fois l''extrême gentillesse des propriétaires qui font tout pour nous faciliter la vie et nous rendre le séjour très agréable." "appartement très agréable complété d''un accueil chaleureux et d''une grande disponibilité de nos hôtes -"
"Bella casa, confortevole e ben attrezzata. Il silenzio ed il comfort sono assicurati.Ottima l'ospitalità e la disponibilità dei proprietari. Un piccola vacanza molto rilassante. Da ritornarci sicuramente." 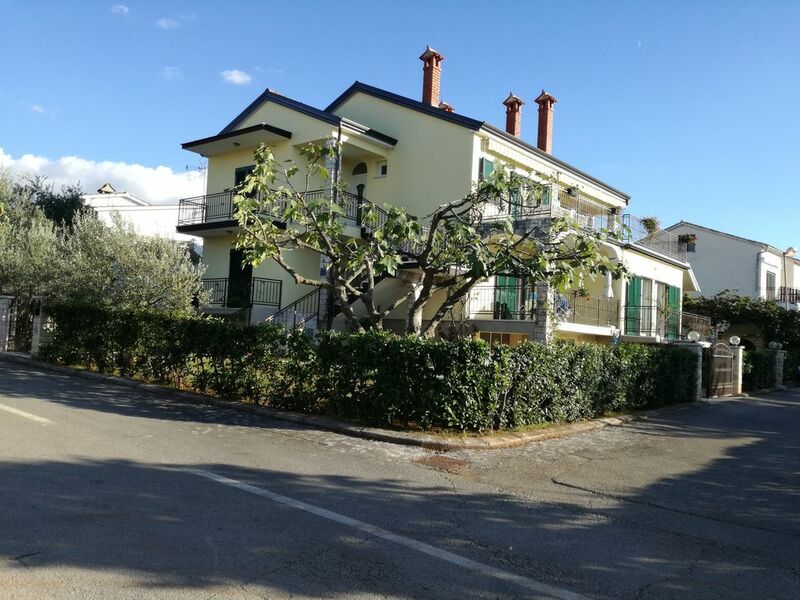 "appartement agreable, bon sejour,proprietaires tres gentils"
"Appartamento molto pulito e attrezzato. Proprietari molto gentili, disponibili e discreti. Luogo silenzioso, vista discreta, app. non lontano dal centro della città. Spiaggia centrale accessibile a piedi (15 min circa). Porec è una cittadina ben tenuta e pulita." Your journey is the shortest via Trieste - Kopar - Buje - Vižinada - Porec. At the entrance to the Porec on the right string restaurant SIESTA and POLIKLINIK "RIDENTAL", here, stay in the parking lot and call our mobile number (00385 959049443) and we pick you up, or with navigation system directly to our Adrese Jadranska 4. Porec. In our region there is very good food with many experiences. In free time you can play tennis, table tennis and golf, horse riding, swimming, hiking, visit grottos, visit Arena in Pula, visit many small tourist resorts in Istria by the sea, hiking on Ucka mountain. There are many kullturele events for example: classical concerts, jazz, street art, Mahler galleries etc.